Florida's Great Python Challenge Is Over; Not Many Are Caught : The Two-Way The month-long hunt ends with just 68 pythons caught, while humorist Dave Barry, in an 'unmasculine' snake encounter, defends himself with barbeque tongs. Bill Booth stretches out a dead Burmese python caught during Florida's "Python Challenge" on Jan. 19. 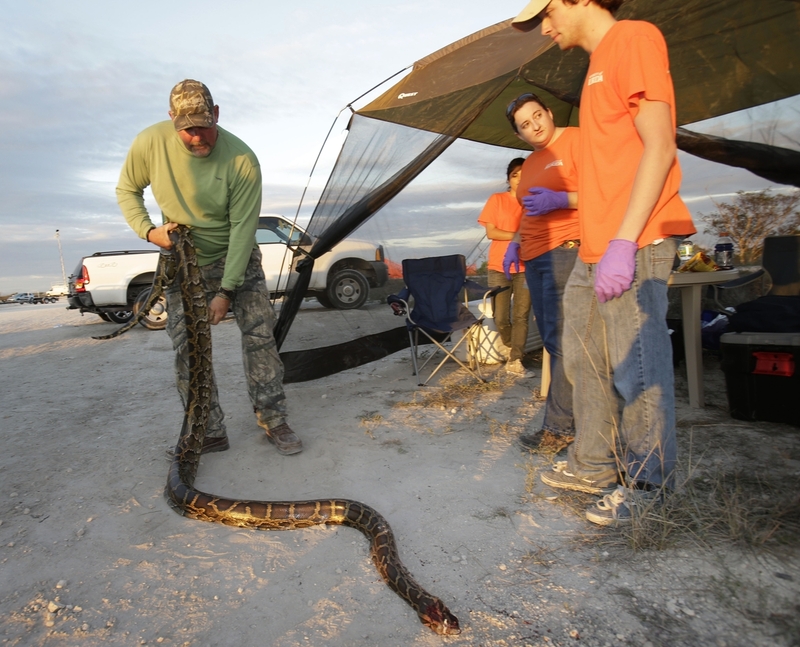 Although not many of the snakes were caught, a successful few hunters will win cash prizes, such as $1,500 for the most pythons taken and $1,000 for the longest python captured. "It was probably actually, really, in real life about 2 feet long, but it was a snake right next to my soda can. And so I made a really un-masculine — I made a sound like a recently castrated Teletubby. And I jumped out and ran out onto the patio and got the first weapon I came across, which was barbecue tongs ... so I go running out with this thing riding at the end of my barbecue tongs and dropped it. And as it happened, it fell into the swimming pool. It made a rookie snake error, which is it swam into the filter basket."